Eliminate processed foods, including fast food, and consume only fresh, whole foods in their natural state. Try to consume quality protein, complex carbohydrates and healthful fats at each meal. Animal protein should be organic, sustainably raised and from as clean a source as possible. Greatly reduce or eliminate sugar and refined flour intake. Eat a variety of fruits and vegetables rated low to moderate on the glycemic index. Strictly avoid high fructose corn syrup. Eat full-fat dairy in moderation; fat-free and lowfat dairy products have been overprocessed and are not natural foods. Eat avocados and nuts, especially almonds, walnuts, and cashews. Use extra virgin olive oil as your primary cooking oil. Strictly avoid margarine, vegetable shortening and products made with partially hydrogenated oils. Consume omega-3 fatty acids daily. Eat salmon, sardines packed in water or olive oil, black cod, or herring twice weekly and take a fish oil supplement on the days you don’t eat fish. Make sure that your fish oil is free of heavy metals. Make ginger and turmeric a regular part of your diet. Drink tea instead of coffee. Drink six–eight glasses of water per day. So, looking at this list, it seems that the anti-inflammatory diet has a lot in common with other nutritional advice I’ve read from sources as widely varied as Michael Pollan, Cookus Interruptus, and Weston Price Foundation. We follow quite a few of these guidelines, but not religiously. For example, we don’t eat oily fish very often — high-quality sustainably-sourced fish is EXPENSIVE, yo. But we do take our cod liver oil daily during the winter, and 2-3 times/week in the summer. Even just loosely following these guidelines for around two years, I have seen some changes in my health. For example: I suffered seasonal allergies for many years. I tried many different medications, and none worked great for me, but without them the sneezing was out of control. I have now gone through two whole summers with few to no allergy symptoms. Nice. I will spare you details, but my gastrointestinal tract is also working great now, even though I had problems for a few years in my early 20s. Those problems inspired me to start exercising and lose 30 pounds, which I’ve kept off for about 5 years now (not counting about one year for pregnancy). I would not call myself a thin person, but I definitely have seen other benefits from my attempts at eating healthy. Now, if I can just find the willpower to lose the final 10 lbs, I’ll be good to go… Resolutions, resolutions. Here’s the entire article, with more details. Update, 1/1/2011: So, is this irony? Poetic justice? The universe trying to tell me something? 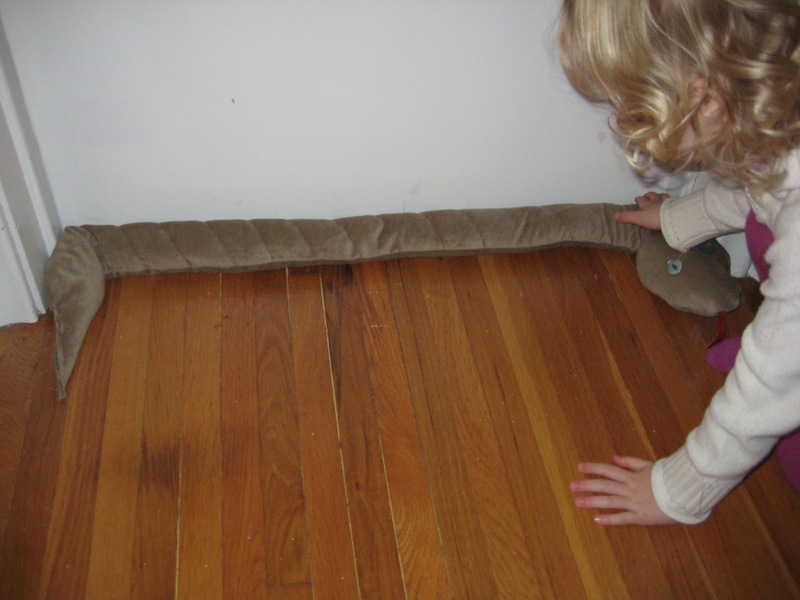 At any rate, less than 5 minutes after I pushed the Publish button on this post, Anneke came down with her first ever true stomach bug. It lasted about 12 hours, so she’s feeling better now. The rest of us feel fine so far, but who knows what today will bring. Funny, huh? Categories: Nutrition, Practical | Permalink. 1. We’ve got a new header, right up on top (RSS reader people will have to click through to see). 2. 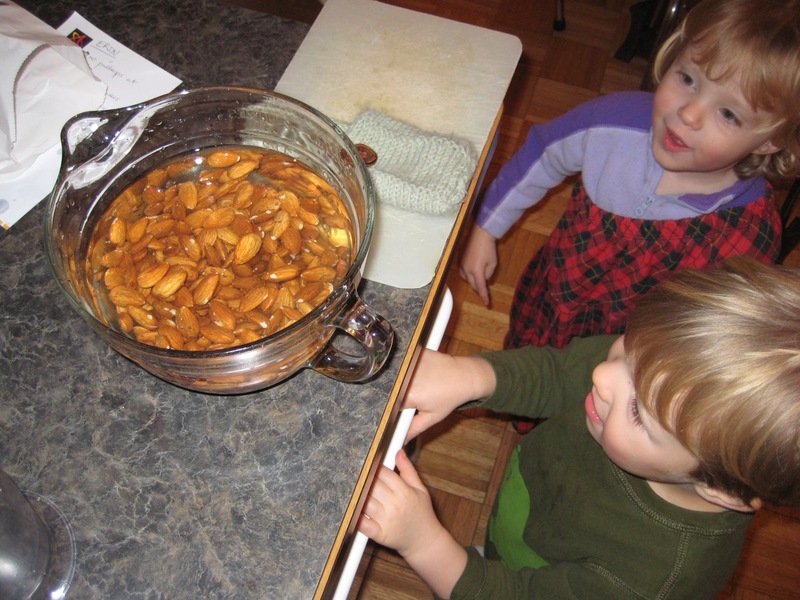 I finally started soaking and drying nuts, another thing that Nourishing Traditions recommends. Result: TASTY. Basically, you soak any kind of raw nut in salt water for 8-12 hours and then dry it in a food dehydrator or oven at a low temp. I think 140 degrees is supposed to be the max. We are fortunate that our oven has a convection fan so we can dry foods in there. Works great for this purpose. Also note: almonds take a LOT longer to dry than walnuts. And really, that’s about all, aside from the usual holiday excitement. I was dreaming about radishes last night, so I think you can expect a garden update soon. No better time than January to plan my 2011 garden. See you next year! Categories: Cooking and baking, Practical, Water/energy efficiency | Tags: Nourishing Traditions | Permalink. Safety tips so far include: wear reflective vest in the evening, take it slow, and, as per my usual advice, take the back roads whenever possible. Also, I really like the ski goggles that Adam got me as an early Christmas present, though they’re not 100% necessary. The Nishiki Uptown was a great find. That thing is a tank. Added bonus: it has horizontal dropouts so after I trash the components this year, Adam could potentially convert it to a single speed or fixie for winter 2011-12. 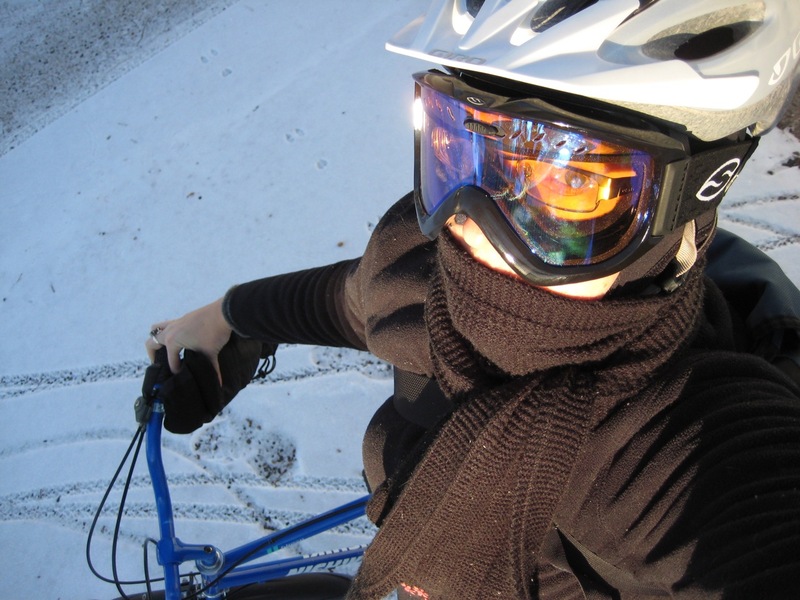 Update, 12/27/2010: Boy, did I pick a great year to commit to winter bike commuting. We’ve had 33″ of snow so far this December, on our way to a record (more is expected later this week). But I only wimped out and took the bus a total of 3 times so far. I will, however, amend my earlier advice about only taking the back roads. During a snow emergency, you’ll want to stick with main roads and try to leave just a little before or a little after the main rush hour. I’ve been taking Bloomington Ave when the side streets are impassable and it’s been mostly pleasant. 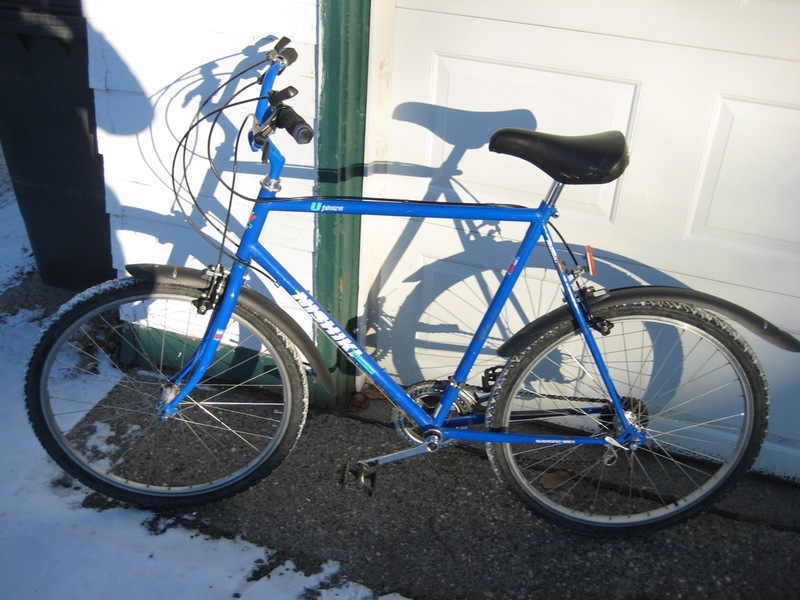 Categories: Community planning, Practical, Theoretical | Tags: bike commuting | Permalink.